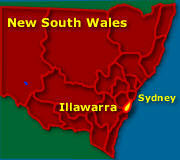 Map of Illawarra NSW - shows towns including the city of Wollongong, roads and National and State Parks. See more Illawarra and Wollongong NSW. 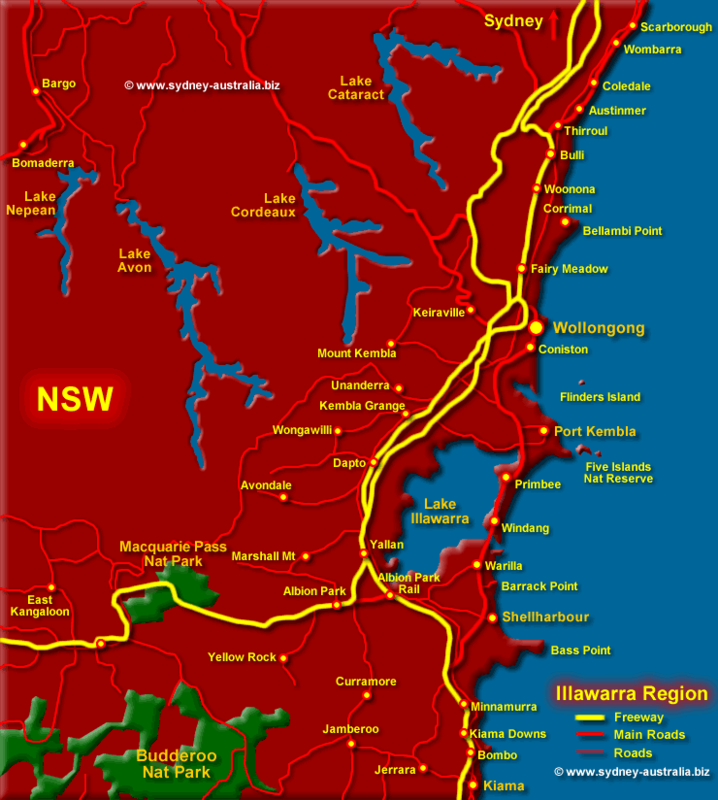 Showing location of Macquarie Pass National Park, Wollongong, Kiama, Shellharbour, Port Kembla, Jamberoo, Fairy Meadow and surrounding towns and area. Also lakes, state and national parks. Wollongong is the third largest city in New South Wales and is both cosmopolitan and on the coast, with lots of beaches, things to do and places of interest to visit. Next Picture: South East NSW Map - South East NSW Map. Previous Picture: North West NSW Map - North West NSW Map. Kangaroo Valley is just west from the South Coast and considered a good place to sight not only the variety of colourful birdlife, but other Australian wildlife within the hilly surrounding forests and bushland. Go shopping for bargains at the many antique and art galleries, visit museums, craft markets and shops, as well as exploring the South Coast of New South Wales. Proceed south along the Princes Highway from Sydney - Approx 1.5 hours drive from Sydney. Weather for Wollongong and Illawarra Weather for Wollongong and Illawarra. You can find places to stay all along the South Coast, some set in truly stunning locations. Beach cabins, holiday homes, serviced apartments in one of the small fishing villages or hotels in town. Search for Wollongong and Illawarra Accommodation.